The Economic Journal, one of the grand old journals of economics, is celebrating its 125th anniversary. The Royal Economic Society (40% of its membership is in the UK, the rest around the world) is collaborating with the publisher, John Wiley & Sons, to make the March 2015 birthday issue freely available online. The theme of the issue is that current top economists look back on classic papers published in the EJ, and offer reflections and analysis. Here are the titles of the papers in bold, with the reference to the classic EJ paper under discussion and weblinks underneath. For those who recognize the original papers and the current authors, no further recommendation is necessary. Dalton, H. (1920). ‘The measurement of the inequality of incomes’, Economic Journal, vol. 30(119), pp. 348–61. Ramsey, F.P. (1927). ‘A contribution to the theory of taxation’, Economic Journal, vol. 37(145), pp. 47–61. Ramsey, F.P. (1928). ‘A mathematical theory of saving’, Economic Journal, vol. 38(152), pp. 543–59. Dunlop, J.T. (1938). ‘The movement of real and money wage rates’, Economic Journal, vol. 48(191), pp. 413–34. Keynes, J.M. (1939). ‘Relative movements of real wages and output’, Economic Journal, vol. 49(193), pp. 34–51. Harrod, R.F. (1939). ‘An essay in dynamic theory’, Economic Journal, vol. 49(193), pp. 14–33. Roy, A.D (1950). ‘The distribution of earnings and of individual output’, Economic Journal, vol. 60(239), pp. 489–505. Becker, G.S. (1965). ‘A theory of the allocation of time’, Economic Journal, vol. 75(299), pp. 493–517. Atkinson, A.B. and Stiglitz, J.E. (1969). ‘A new view of technological change’, Economic Journal, vol. 79(315), pp. 573–8. Atkinson, A.B. and Sandmo, A. (1980). ‘Welfare implications of the taxation of savings’, Economic Journal, vol. 90(359), pp. 529–49. Loomes, G. and Sugden, R. (1982). ‘Regret theory: an alternative theory of rational choice under uncertainty’, Economic Journal, vol. 92(368), pp. 805–24. Cohen, W.M. and Levinthal, D.A. (1989). ‘Innovation and learning: the two faces of R & D’, Economic Journal, vol. 99(397), pp. 569–96. Nordhaus, W.D. (1991). ‘To slow or not to slow: the economics of the greenhouse effect’, Economic Journal, vol. 101(407), pp. 920–37. Those who find the rise in income inequality over the last few decades to be concerning, like me, can find themselves facing the "so what?" question. Is my concern over rising inequality an ethical or perhaps an aesthetic judgement, and thus a personal preference where economics really doesn't have much guidance to offer? Faced with this possibility, the temptation arises to claim the following syllogism: 1) We have experienced greater inequality, which is undesirable. 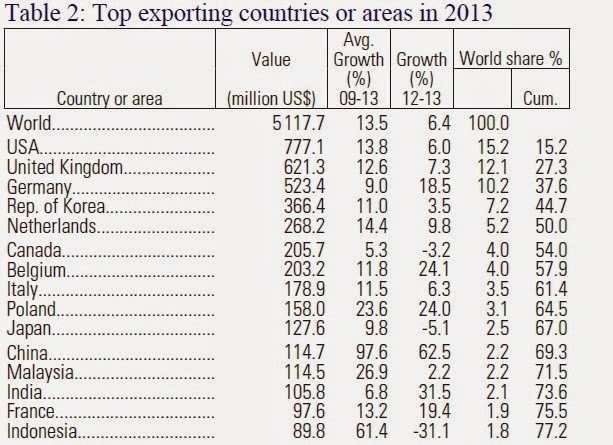 2) We have experiences slower economic growth, which is undesirable. 3) Therefore, greater inequality causes slower economic growth. A variety of studies have undertaken to prove a connection from inequality to slower growth, but a full reading of the available evidence is that the evidence on this connection is inconclusive. 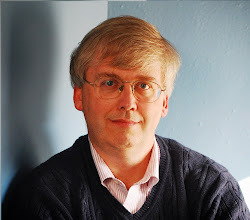 For example, the OECD has recently published a report called "In It Together: Why Less Inequality Benefits All," and Chapter 3, titled "The Effect of Income Inequality on Economic Growth," offers an OECD analysis seeking to connect the two. But before presenting the new study, the OECD report has the honesty and forthrightness to point out that the full body of literature on this subject is inconclusive as whether such a relationship even exists--and if so, in what direction the relationship goes. The report first points out (pp. 60-61 that as a matter of theory, one can think up arguments why greater inequality might be associated with less growth, or might be associated with more growth. For example, inequality could result less growth if: 1) People become upset about rising inequality and react by demanding regulations and redistributions that slow down the ability of an economy to produce growth; 2) A high degree of persistent inequality will limit the ability and incentives of those in the lower part of the income distribution to obtain more education and job experience; or 3) It may be that development and widespread adoption of new technologies requires demand from a broad middle class, and greater inequality could limit the extent of the middle class. In passing, it's worth noting that the first reason falls into the category of "frustrated people killing the goose that lays the golden eggs." In other words, finding a correlation between rising inequality and slower growth could be a sign of dysfunctional responses to the rise in inequality. On the other side, inequality could in theory be associated with faster economic growth if: 1) Higher inequality provides greater incentives for people to get educated, work harder, and take risks, which could lead to innovations that boost growth; 2) Those with high incomes tend to save more, and so an unequal distribution of income will tend to have more high savers, which in turn spurs capital accumulation in the economy. The report doesn't mention a third hypothesis that seems relevant in a number of developing economies, which is that fast growth may first emerge in certain regions or industries, leading to greater inequality for a time, before the gains from that growth diffuse more widely across the economy. The large empirical literature attempting to summarize the direction in which inequality affects growth is summarised in the literature review in Cingano (2014, Annex II). That survey highlights that there is no consensus on the sign and strength of the relationship; furthermore, few works seek to identify which of the possible theoretical effects is at work. 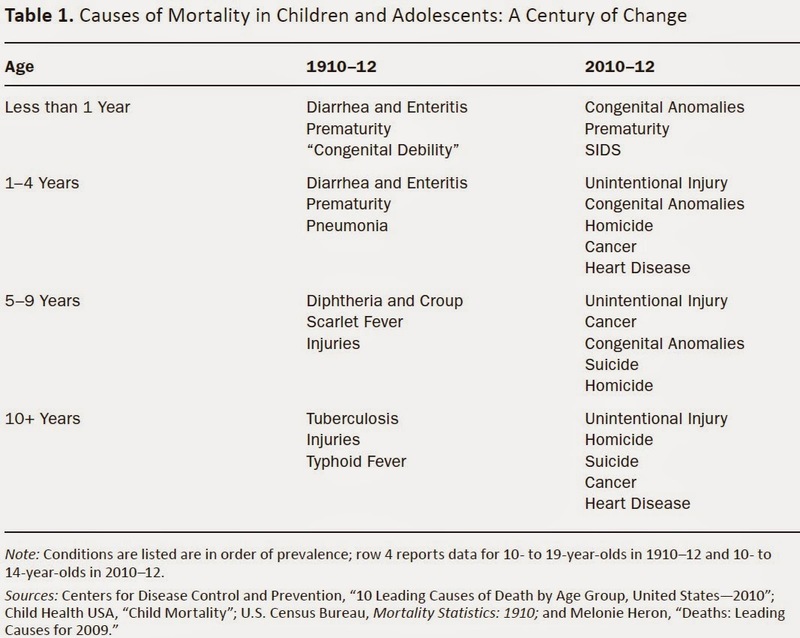 This is partly tradeable to the multiple empirical challenges facing this literature. The report then goes on to discuss issues like: 1) variations in estimation methods, including whether the analyst looks at one country over time, multiple countries at a point in time, or multiple countries over time, along with the statistical tools used; 2) in many countries around the world, the data on income distribution is not measured well, not measured consistently over time, and not measured in ways that are easily comparable to other countries; 3) in empirical studies the already-weak data on inequality is often boiled down into a single number, like a Gini coefficient or a ratio between those in the 90th and 10th income percentiles, a simplification that might miss what is happening; 4) the connections between income inequality and growth might differ across groups of countries (like high-income and low-income countries), and looking at all countries together averages out these various effects; and 5) whether (and how) the researcher should take into account factors like the extent of progressive taxation and redistribution, the extent of financial markets, or the degree of economic and social mobility over time. There's an old saying that "absence of evidence is not evidence of absence," in other words, the fact that the existing evidence doesn't firmly show a connection from greater inequality to slower growth is not proof that such a connection doesn't exist. But anyone who has looked at economic studies on the determinants of economic growth knows that the problem of finding out what influences growth is very difficult, and the solutions aren't always obvious. For example, the OECD study argues that inequality leads to less investment in human capital at the bottom part of the income distribution. If this result holds up in further study, an obvious answer is not to focus on inequality directly, but instead to focus on additional support for human capital accumulation for those most in need. There are a few common patterns in economic growth. All high-income countries have near-universal K-12 public education to build up human capital, along with encouragement of higher education. All high-income countries have economies where most jobs are interrelated with private and public capital investment, thus leading to higher productivity and wages. 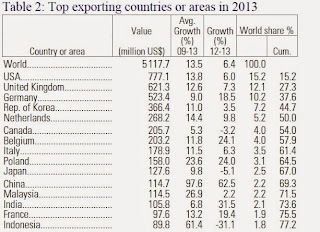 All high-income economies are relatively open to foreign trade. In addition, high-growth economies are societies that are willing to allow and even encourage a reasonable amount of disruption to existing patterns of jobs, consumption, and ownership. After all, economic growth means change. On the other hand, it's also true that fast-growing countries around the world, either now or in the past, show a wide range of levels and trends of inequality, as well as considerable variation in the extent of government regulation and control, patterns of taxation and redistribution, structure of financial sector, and much more. Consider the pattern of China's fast economic growth in recent decades, with rising inequality and an evolving mixture of private initiative and government control. At least to me, China looks like a situation where growth is causing inequality, not where inequality is slowing growth. It may be that the question of "does inequality slow down economic growth" is too broad and diffuse to be useful. Instead, those of us who care about both the rise in inequality and the slowdown in economic growth should be looking for policies to address both goals, without presuming that substantial overlap will always occur between them. The single largest federal program for providing cash assistance to those with low incomes is the Earned Income Tax Credit, which in 2014 reduced taxes owed by the working poor by about $3.6 billion while transferring to those households an additional $60.8 billion (according to Table 14-1 in the Analytical Perspectives volume of the proposed US budget. This isn't as much as programs with non-cash benefits, like Food Stamps and Medicaid. But it's more than what is spent on welfare, or on the Supplemental Security Income program for the low-income disabled and elderly. 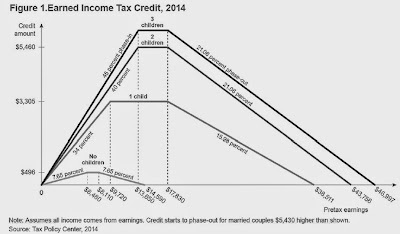 In "Earned Income Tax Credit in the United States," which appears in the Journal of Social Security Law (2015, 22:1, pp. 20-30), Elaine Maag provides a useful overview of the program. For economists, the big selling point of the EITC is that it rewards work. The classic problem that arises when government provides assistance to those with low income levels is that as a person works to earn an extra $100, they often find that the government benefits are then reduced by nearly that same amount or sometimes even more. As a result, many low-income people who work are saving the government some money, but not much increasing their actual after-benefits, after-taxes standard of living. In contrast, the EITC is set up so that the work disincentives are greatly reduced. Maag offers a graph familiar to those who know the program that shows how it operates. "In 2014, a family with one child was eligible for a subsidy of 34 cents for each dollar earned up to $9,720—a maximum credit of $3,305. A family qualified for the $3,305 credit until its income reached $17,830. At that point, the EITC declined by almost 16 cents for each additional dollar of earnings; the credit phased out completely once earnings reach $38,511 (figure 1). Larger credits are shown for families with more than one child, as well as the small credit available to a family with no custodial children." Thus, a low-income person with one child who starts working gets a bonus of 34 cents on the dollar up to a certain level of earnings--which helps to offset their declining eligibility for other government benefits. For this family, the credit does phase out above $17,830 in income, so each $1 earned above this amount means that the amount of the credit falls by about 16 cents. This represents a lower incentive to work--but losing only 16 cents in benefits for every $1 earned is a lot better than losing, say $1 in benefits for every dollar earned. And any means-tested program has to be phased out in some way as income levels rise. Along with the federal EITC, 23 states have also added their own versions of the EITC to their state-level income tax codes. Maag reviews the empirical evidence that the EITC does seem to encourage greater levels of work participation in the phase-in range, although it doesn't seem to have much effect on average hours worked and doesn't do much to discourage work hours in the phase-out range. She writes (footnotes omitted): "The official measure of poverty in the US does not include changes in resources due to taxes. If it did, scholars have determined that the EITC wouldhave been credited with lifting 6.5 million people out of poverty in 2012, including about 3.3 million children. Changes in income as a result of the EITC are associated with better health, more schooling and higher earnings in adulthood." Overall, I think one can make a plausible case for a dramatic increase in the amount spent on the EITC. But honesty compels me to point out that the EITC has two well-known shortcomings and problems that need to be mentioned. The program is heavily focused on families with children. Thus, it doesn't help the situation of a childless person who is below the poverty line and working for near minimum-wage. 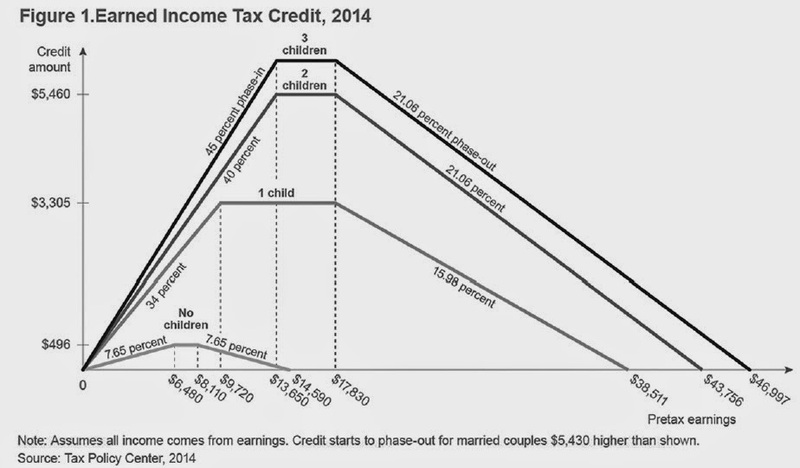 EITC benefits are also lower for married couples. Any government program where the benefits are higher for those who are unmarried with children deserves a closer look to see if the incentives can be structured differently. The EITC adds a lot of complexity to the tax forms of the working poor, who are often not well-positioned to cope with that complexity, nor to hire someone else to cope with it. About 20% of EITC payments go to those who don't actually qualify, which seems to happen because low-income people hand over their tax forms to paid tax preparers who try to get them signed up. Of course, there's another group, not well-measured as far as I know, of working-poor households who would be eligible for the EITC but don't know how to sign up for it. These issues don't have neat and tidy answers, but they do have messy and practical answers. It might seem that the debate over e-cigarettes and "vaping" should be a fundamentally empirical question. Does vaping primarily reduce cigarette smoking? If so, then it should be viewed as an overall benefit to public health and, at a minimum, not discouraged. Or does vaping serve as a gateway that leads to increased cigarette smoking? If so, then it should be discouraged in many of the same ways as cigarette smoking: public health advisories, taxes, no-vaping in public spaces, and the like. But interpreting the evidence isn't simple. For example, the Centers for Disease Prevention and Control (CDC) put out a report on April 17, 2015, titled "Tobacco Use Among Middle and High School Students — United States, 2011–2014." The first paragraph offers this statement: "In 2014, e-cigarettes were the most commonly used tobacco product among middle (3.9%) and high (13.4%) school students. Between 2011 and 2014, statistically significant increases were observed among these students for current use of both e-cigarettes and hookahs (p<0.05), while decreases were observed for current use of more traditional products, such as cigarettes and cigars, resulting in no change in overall tobacco use." Some people see this shift from regular cigarettes to e-cigarettes as good news, because the health effects of e-cigarettes are lower (that is, they have nicotine, but none of the other by-products of smoking that are typically linked to cancer). Some see the rise in e-cigarettes as a threat to be stopped. As the government regulators figure out what to do, it's important to remember that there is an industry lobbying powerhouse with a large incentive to restrict e-cigarettes: the big tobacco companies. Jonathan H. Adler, Roger E. Meiners, Andrew P. Morriss, and Bruce Yandle make this argument in "Bootleggers, Baptists, and E-cigs," which appears in the Spring 2015 issue of Regulation magazine. A bootleggers-and-Baptists coalition refers to legal restrictions that arise from a combination of those who don't want the activity to occur and those who want to use the regulations to cripple potential competition. In the canonical example, both bootleggers and Baptists favored laws prohibiting legal alcohol sales--but for different reasons. Other common examples include when industry partners with environmentalists to support tough environmental regulations, which industry favors because it will cripple any new competition. In another example, existing examples of legal gambling--like state lotteries--often partnered with anti-gambling forces to oppose expanded gambling opportunities from Native American casinoes. Bruce Yandle and Adam Smith have a recent book out on the subject: Bootleggers and Baptists: How Economic Forces and Moral Persuasion Interact to Shape Regulatory Politics. Here's an interview with Yandle from a few years back. In the case of e-cigarettes, the Adler, Meiners, Morriss, and Yandle essay points out that few years back, the four big tobacco companies (Philip Morris Inc., R. J. Reynolds, Brown & Williamson and Lorillard) signed an agreement in which they would pay $206 billion over time to 46 states, and in exchange, the states would not sue them for how smoking increased the health care spending costs of those states. Many anti-smoking groups broadly favored the settlement, because worked like a tax on cigarettes to push tobacco companies to raise their prices to consumers and thus discourage smoking. But the big tobacco companies were concerned that new entrants to the industry might be able to undercut them on price, because new entrants would not have to make these payments to the states. As the Adler et al. group explains: "Therefore the MSA [Master Settlement Agreement] provided that for every percent of market share over 2 percent lost by a participating cigarette manufacturer, the manufacturer would be allowed to reduce its payments to the states by 3 percent, unless each participating state enacted a statute to prevent price competition from non-participating manufacturers (which each state did). The statutes require nonparticipating cigarette producers to make payments equal to or greater than what they would owe had they been participants in the agreement, to eliminate any cost advantage." In short, the political process over how e-cigarettes should be regulated is not a pure public health argument. E-cigs represent a competitive threat to the tobacco industry, which will lobby to have have them regulated at least as harshly as conventional cigarettes, although the health issue posed by e-cigs (which, by the way, can contain little or no nicotine if the vaper desires) is clearly much lower. States will be worried that this new competition from vaping might in some way affect their revenues they are expecting from the tobacco companies. A certain group of anti-smoking neo-prohibitionists has pretty much already decided to view vaping as an insidious precursor to conventional cigarettes. 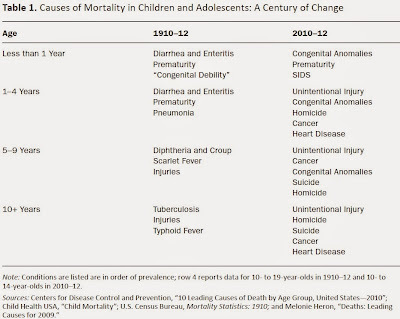 As I have pointed out, the anti-smoking efforts that began with the US Surgeon General's report back in 1964 have saved millions of lives, but even though smoking rates have diminished, tobacco use is still linked to 400,000 premature deaths and another $300 billion in economic costs due to health care costs and lost productivity each year. Perhaps e-cigs can help to reduce these costs. The evidence on how e-cigarettes interact with use of conventional cigarettes is still accumulating, but before we run with the assumption that e-cigs are part of the same problem, it's worth some critical scrutiny on the bootlegger-and-Baptist coalition that is pushing for this result. John Stuart Mill was born 209 years ago on May 20, 1806, and has a claim to being the greatest economist of his time. His Principles of Political Economy, first published in 1848, served as the leading overview of the subject of economics four four decades, until Alfred Marshall published his Principles of Economics in 1890. Mill's 1848 book is wonderfully systematic and detailed, and has its share of original insights for its time. Some of my own favorites include the idea that it is possible to separate for analytical purposes the issues of production and distribution; the systematic treatment of supply and demand in setting prices; the discussion of the function of money; and the arguments about the economy evolving toward a stationary state. However, I think Mill may rank higher as a political philosopher than as an economist. "I do not mean that they choose what is customary, in preference to what suits their own inclination. It does not occur to them to have any inclination, except for what is customary. Thus the mind itself is bowed to the yoke: even in what people do for pleasure, conformity is the first thing thought of; they like in crowds; they exercise choice only among things commonly done: peculiarity of taste, eccentricity of conduct, are shunned equally with crimes: until by dint of not following their own nature, they have no nature to follow: their human capacities are withered and starved: they become incapable of any strong wishes or native pleasures, and are generally without either opinions or feelings of home growth, or properly their own. ..."
"If a person possesses any tolerable amount of common sense and experience, his own mode of laying out his existence is the best, not because it is the best in itself, but because it is his own mode." If the claims of Individuality are ever to be asserted, the time is now, while much is still wanting to complete the enforced assimilation. It is only in the earlier stages that any stand can be successfully made against the encroachment. The demand that all other people shall resemble ourselves, grows by what it feeds on. Perhaps the good news here is that Mill's comments still read as timely today, which suggests that perhaps this balance between conformity and individualism is not decided once and for all, but is an ongoing challenge for each of us to accept, both in having the willingness and energy to make our own choices, and in the level of tolerance and acceptance we offer as a society to those who (peacefully) choose not to conform with our own decisions. 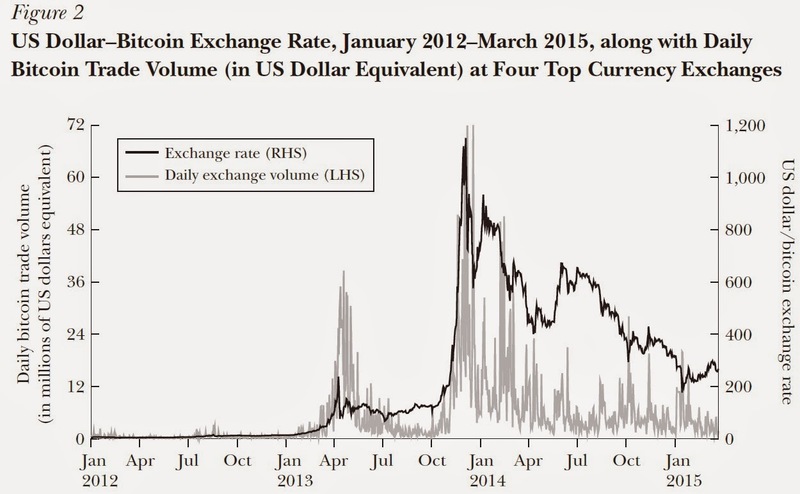 My own sense is that popular interest in Bitcoin peaked about 12-18 months ago. Perhaps that interest will return. But for now, my sense is that Bitcoin represents a remarkable--indeed, a breakthrough--innovation which nonetheless is beginning to show its limitations. Rainer Böhme, Nicolas Christin, Benjamin Edelman, and Tyler Moore provide an overview of "Bitcoin: Economics, Technology, and Governance" in the Spring 2015 issue of the Journal of Economic Perspectives (29:2, pp. 213-38). (Full disclosure: My actual job, as opposed to my blogging hobby, has been to work as Managing Editor of the JEP since the first issue in 1987.) The conclusions in this post are my own, but many of the facts will draw on the Böhme, Christin, Edelman, and Moore essay. Broadly speaking, money operates on a bookkeeping system: that is, private parties can't just claim to have money, but instead must have it transferred from another account into your own account. With traditional money, these accounts can be verified by banks, financial institutions, and regulators, and the central bank reserves to itself the power to create money. The remarkable innovation of Bitcoin is that it has created a currency that is automated and private, with no need for a central bank or regulatory system. A total of about 14 million Bitcoins have been created, with a US dollar value of about $3.5 billion. They have been used in about 62 million transactions. Anyone who signs up a Bitcoin account is given a "public" number, which is your account number to the system as a whole, and also a "private" number, which is your personal passcode for accessing the system. The heart of Bitcoin is the "blockchain," which is a complete listing of every Bitcoin ever issued and all the transactions that have happened with each. Everyone with a Bitcoin account can look at the blockchain if they wish--but it's such an enormous file (and getting larger with each transaction) that most people could not download it to their personal computer even if they wanted to. So most people using Bitcoin hire a "wallet" company which holds your copy of the blockchain, and through which you can operate your account. Some wallet companies know your "private" number; some don't. With traditional money, a transaction is verified by financial institutions operating in a regulatory framework. For Bitcoin, a transaction is verified when the blockchain is updated. But this is where the process gets a little messy and very creative. Someone needs to be paid for updating the blockchain, and of course, they can be paid in Bitcoins for doing so. To ensure trustworthiness, we actually want to have multiple actors all updating the blockchain at the same time, so that they can serve as a check on each other. And we need those actors updating the blockchain to pay some cost, because if there was no cost to participate, random players could claim to have received Bitcoins from others. Every 10 minutes or so, the recent Bitcoin transactions are grouped into a "block." The Bitcoin automated system generates a mathematical puzzle based on the preexisting contents of the blockchain. The puzzle is not fundamentally hard to solve, but it includes a random component and takes a lot of computing power. In other words, those with faster computers will have a better chance of solving the puzzle, but because of the randomness, speed doesn't always win. The first to solve the puzzle posts a new blockchain, along with a proof-of-work that the puzzle was solved. Those who solve puzzles are called "miners," and again, they are rewarded with Bitcoin in a way that expands the quantity of currency at a smooth pace over time. Böhme, Christin, Edelman, and Moore estimate that in solving the Bitcoin puzzles, Bitcoin miners use about 173 megawatts of electricity at any given time, which is about 20% of the output of a nuclear power plant. But voting on the authenticity of a transaction requires first working to solve a mathematical puzzle that is computationally hard to solve (although easy to verify). Solving the puzzle provides “proof of work”; in lieu of “one person, one vote,” Bitcoin thus implements the principle of “one computational cycle, one vote.” Through this design, the proof-of-work mechanism simultaneously discourages creating numerous fake identities and also provides incentives to participate in verifying the block chain. It is worth emphasizing the remarkable accomplishment of the Bitcoin system. It functions! However, as this brief description has hinted in various places, Bitcoin has limitations that have begun to emerge. Here are some of the main ones. 1) Bitcoin isn't anonymous: it's pseudonymous. For example, say that you use a Bitcoin account to mail-order something for delivery to your home. Now there is a connection between your Bitcoin account and your address, and any other transactions through your account can be traced to you. There are Bitcoin-based companies called "mixers" that try to make transactions more anonymous. They take a batch of Bitcoin transactions and scramble up who is receiving what from whom. But it turns out that their scrambling can often be unscrambled, if law enforcement wants to commit the resources to doing it. 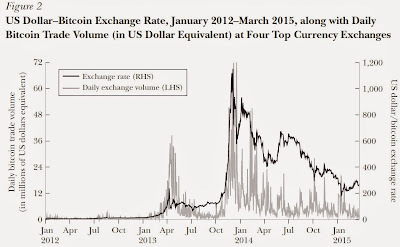 2) The dollar-Bitcoin exchange rate can move abruptly, which makes Bitcoin less suitable as a transaction currency. The price of Bitcoin spiked enormously in late 1013, going from about $200 per Bitcoin to almost $1,200 per Bitcoin, before then falling back. A currency that fluctuates this wildly ends up looking less like a mechanism for buying and selling, and more like a financial investment with risky characteristics. Indeed, a study a couple of years ago found that more than half of existing Bitcoins either took more than a year to be spent or had not been spent. 3) It's not clear how the Bitcoin technology would function for widespread everyday uses. As noted above, finalizing a Bitcoin transaction--as miners solve mathematical puzzles and work toward a definitive update of the blockchain-- takes about a hour to be finalized. If Bitcoin had to deal with even a modest fraction of the number of transactions commonly handled by, say, Visa or American Express, the system would be overwhelmed by the number of transactions and unable to function. 4) Bitcoin itself operates remarkably well, but most people use Bitcoin through a number of platforms that are vulnerable to fraud and cyberattack. For example, there are currency exchange platforms that switch Bitcoin to conventional currencies. There are "digital wallet services" that host your Bitcoin account and your personal copy of the blockchain, and that many people use for making Bitcoin transactions. There are the "mixers" I mentioned above, which take a batch of Bitcoin transactions and scramble them together, to increase the anonymity of the transactions. These platforms are vulnerable to cyberattack and fraud, and when you pay these platforms, you are revealing that you are linked to the Bitcoin currency, thus compromising your anonymity to some degree. In short, dealing with Bitcoin is full of risks and costs. It may be worthwhile for some large purchases under particular circumstances, but at least as Bitcoin is currently constituted, it seems unlikely to become a truly large-scale force in modern finance. So what's next? One vision is that other forms of virtual money will follow where Bitcoin has already broken the trail and this is already happening in various ways. I'm sure that some of these will have niche success, but I would be surprised if they have more. As virtual currencies become larger, governments will insist on increased disclosure and degrees of regulation. As governments requirements rise, the advantages of virtual currencies will diminish. Bitcoin gives us, for the first time, a way for one Internet user to transfer a unique piece of digital property to another Internet user, such that the transfer is guaranteed to be safe and secure, everyone knows that the transfer has taken place, and nobody can challenge the legitimacy of the transfer. . . . All these are exchanged through a distributed network of trust that does not require or rely upon a central intermediary like a bank or broker. What kinds of digital property might be transferred in this way? Think about digital signatures, digital contracts, digital keys (to physical locks, or to online lockers), digital ownership of physical assets such as cars and houses, digital stocks and bonds . . . and digital money. Those who would like some additional reading about the economics of Bitcoin might begin with the discussion and articles cited in my post "How Does Bitcoin Work?" (September 24, 2014). Maybe this is the kind of factoid that is only of interest to me, but the US Bureau of the Census calculates the "mean center of population for the United States"--that is, if you average the locations where everyone lives in the US, what's the average location? Back in 1790, the average location of the population was near Washington, DC. 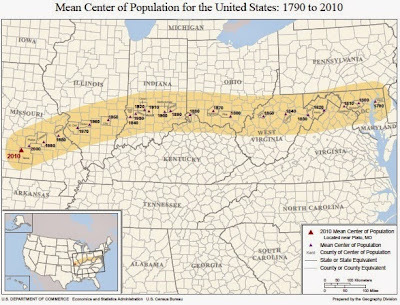 Unsurprisingly, over time the center of the population moved west, as additional western states were added. I found myself mildly surprised by three factors about the movement of the average location of an American in the last couple of centuries. 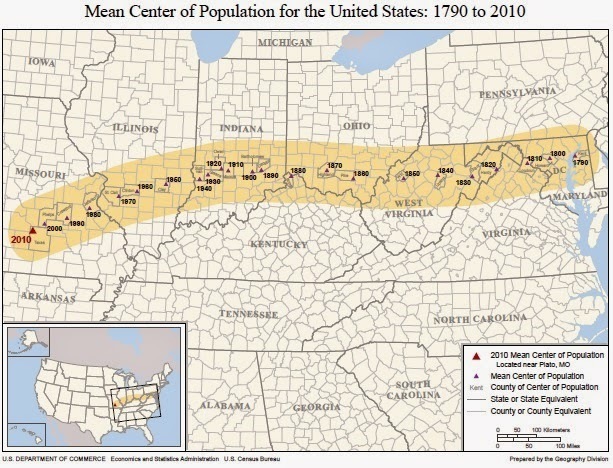 1) I'm surprised that the center of the US population was already in Maryland in 1790. I would have thought that with a substantial share of the population in Philadelphia and New York, as well as Boston and New England, that the central location in 1790would have been further north. 2) I'm surprised that the movement has continued at such a steady pace in recent decades. 3) I'm surprised that the average location of the population has reached the middle of Missouri, apparently headed for Oklahoma in another couple of decades. During my adult life, the main source of immigration to the U.S. has always been Mexico. 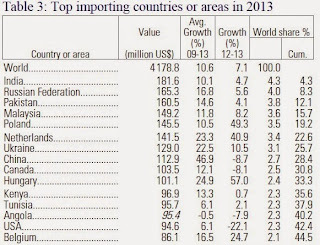 Thus, I was surprised to see that for 2013, immigration from China and India exceeded that from Mexico. The data comes from analysts at the US Census Bureau, Eric B. Jensen, Anthony Knapp, C. Peter Borsella, and Kathleen Nestor, and presented at a recent conference under the title, "The Place-of-Birth Composition of Immigrants to the United States: 2000 to 2013." 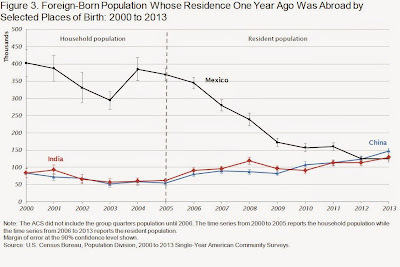 As I have noted in the past, immigration from Mexico has dropped off substantially in the last few years. Indeed, a few years ago when the U.S. unemployment rate was still so elevated in the aftermath of the Great Recession, net migration from Mexico to the U.S.--that is, new arrivals minus departures--may have been slightly negative. Over the last decade or so, a combination of stronger enforcement at the border, along with a gradually stronger economy in Mexico and fewer children per women in Mexico have meant fewer young people on the move looking for work. The data here comes from the American Community Survey. It asks people about whether they were in another country the year before. It does not ask whether they are legal or illegal immigrants. If undocumented immigrants are less likely to answer such surveys, they will be undercounted. While the point surely has some truth, it's also true that the ACE is often used together with a variety of other measures (including US and Mexican Census data) as part of inferring the number of undocumented immigrants. Precisely because the survey does not ask about legal or illegal immigration status, many undocumented migrants do seem to fill it out accurately. The Census Bureau economists also offer some interesting observations about the demography of these migrant groups. Concerning China: "Initially, immigrants born in China were concentrated around the 20-29 age group. Also, there was a relatively high percentage of females relative to males in the 0-4 age group. More recently, the age structure is concentrated around the college-aged populations, with the largest percentage point increases in the 15-19 and 20- 24 age groups for both males and females." 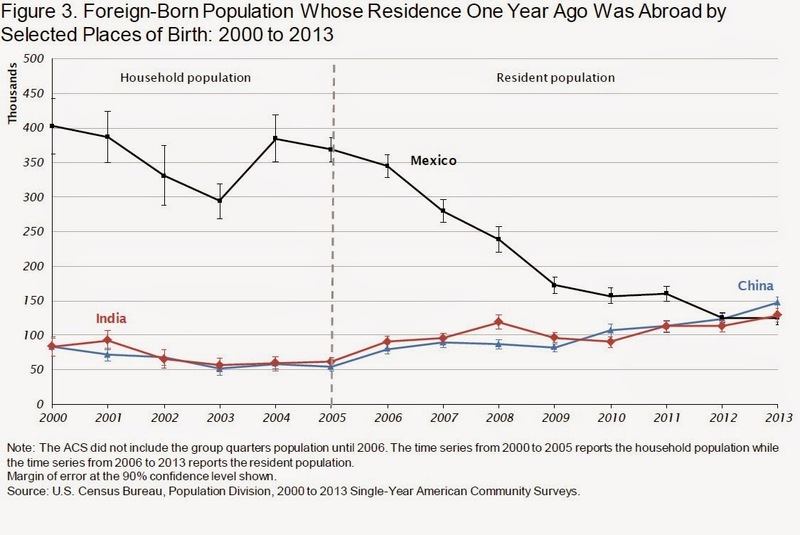 Concerning Mexico: "The age distribution of immigrants born in Mexico became older between the 2005-2007 and 2011-2013 periods. The percentage of males and females in the 0-4, 15-19 and 20-24 age groups declined. The percentage in the 40-44, 55-59, and 65 and over age groups increased for both males and females." Concerning India: "Most immigrants born in India are concentrated in ages 20-34, with the largest percentage in the 25-29 age bracket. This is consistent for both males and females." The total number of migrants working in other countries worldwide is now approaching 250 million. Many of them send money home, and remittances are on their way to becoming an important part of the global financial system. The World Bank Migration and Remittances Team, Development Prospects Group, offers an overview in its Migration and Development Brief of April 13, 2015. Here's a pattern showing the rise in remittances over time compared to some other international financial flows. 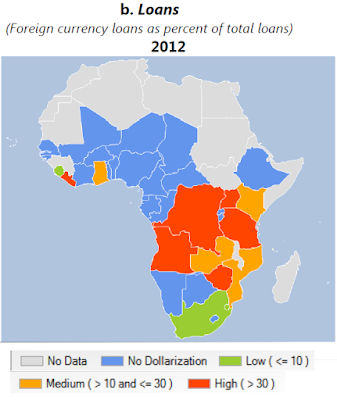 Back in 1990, international remittances were lower than official development assistance (ODA). 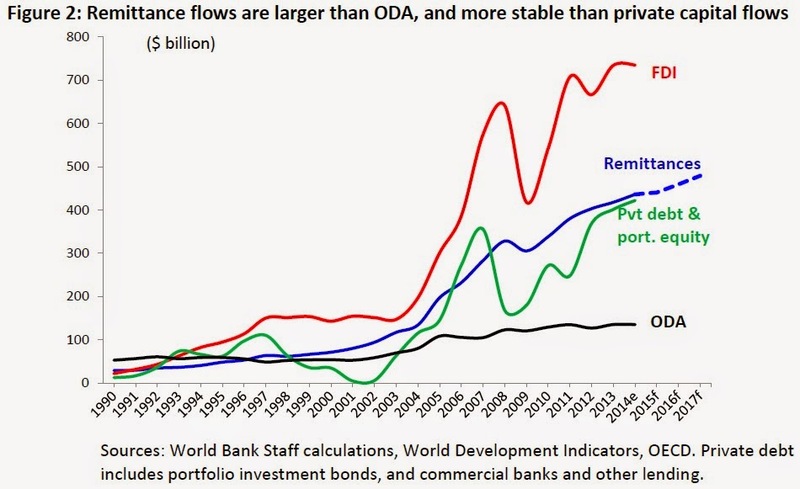 Flows of foreign direct investment (FDI) to developing countries were also smaller than ODA, as were flows of private debt and portfolio equity to developing countries. 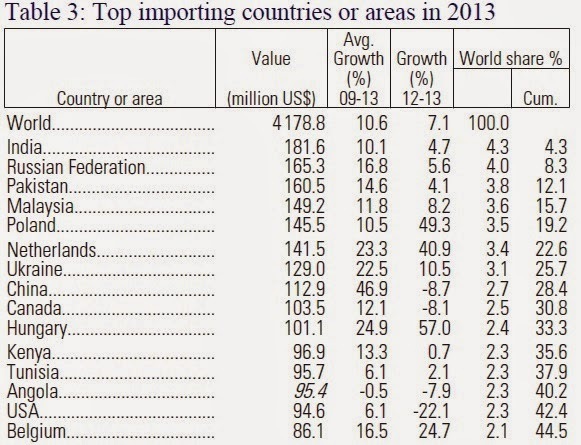 (The FDI flows to developing countries show here exclude China.) Remittances have been larger than development assistance for some years now, and the gap is growing. Perhaps more surprising, remittances also outstripped debt and portfolio equity flows to developing countries in recent years. The flows of remittances also look quite stable compared to other private-sector capital flows. As one might expect, the amount of remittances will be biggest for some of the larger economies in the developing world, but expressed as a share of GDP, the amount of remittances will be largest for some smaller economies. 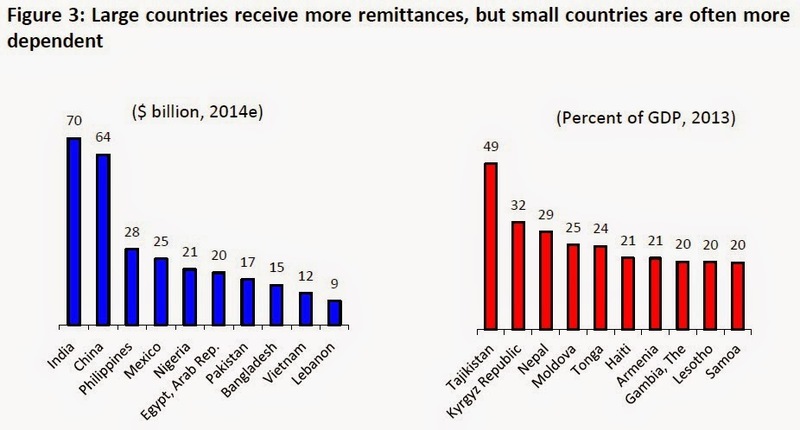 Remittances are important for their sheer size, and because they offer a way for extended households and kinship networks in low-income countries to help themselves in a direct way. They are also goign to be a subject of policy. For example, the World Bank estimates that at present, transferring $200 to a recipient country on average incurs a fee of about 8%. It seems plausible that technology and the growth of these markets should be able to reduce this cost substantially. If the cost of transfers could be cut to 3%, OECD estimates that it would benefit the recipients of these remittances by $20 billion per year. The key question here is that making international flows of capital cheaper and easier comes into conflict with the policy agenda of avoiding money-laundering and cutting off financial assistance to terrorist groups. Another possibility is that low-income countries will issue bonds in their own currencies, hoping to attract investment from those with remittances to send. The World Bank researchers explain: "A diaspora bond – a low denomination security with a face value of $1,000, say, carrying a 3-4% interest rate and 5-year maturity – issued by a country of origin could be attractive to migrant workers who currently earn near-zero interest on deposits held in host-country banks. 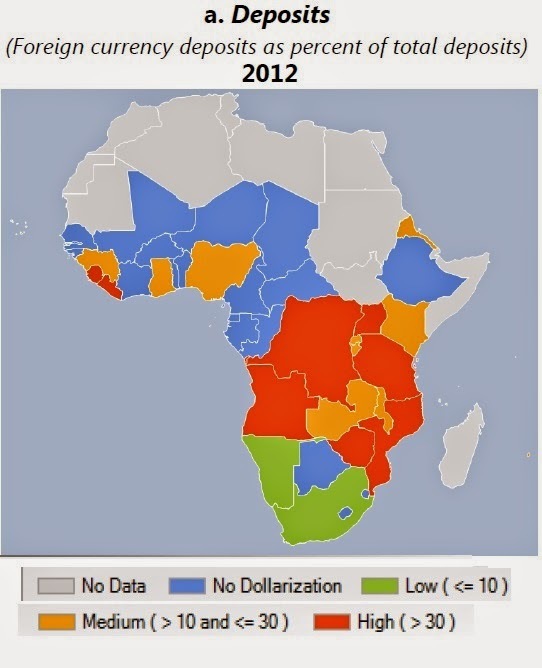 Diaspora bonds could be used to mobilize a fraction – say, one-tenth – of the annual diaspora saving, that is, over $50 billion, for financing development projects." India and Israel have already taken steps along these lines, but many low-income countries around the world could give it a try. A more complex step is to use the expected inflow of future remittances as collateral, in what is known a "future-flow securitization of remittances"--which can then lead to lower borrowing costs or longer borrowing terms for governments of developing countries. Say that you are someone who believes strongly that human-driven emissions of carbon and other greenhouse gases are leading to substantial climate change. You believe that the world probably needed to start acting aggressively to confront this issue back in 1992 when the United Nations Framework Convention on Climate Change was announced, and certainly after the Kyoto Protocol was signed in 1997 and went into force in 2005. You are deeply worried that the world may have already blown past a number of warning signs about climate change, and that time for taking meaningful action has become uncomfortably slim. If you are that person, you need to be thinking seriously about geoengineering--that is, taking steps to deliberately alter the earth's climate to counteract the effects of climate change. We may hate the idea of countering amazing amounts of pollution with yet more pollution of a different type. But the option is simply too cheap to ignore. It’s not like anyone would literally mimic Mount Pinatubo by pumping 20 million tons of sulfur dioxide into the stratosphere. At the very least, given current technology and knowledge, the sulfur would likely be delivered in the form of sulfuric acid vapor. Sooner rather than later, we may be looking at particles specifically engineered to reflect as much solar radiation back into space as possible, maximizing the leverage. It may only take a fleet of a few dozen planes flying 24/7 to deliver the desired amount. Some have gone as far as to calculate how many Gulfstream G650 jets it would take to haul the necessary materials. But such specifics are indeed too specific. What matters is that the total costs would apparently be low compared to both the damage carbon dioxide causes and the cost of avoiding that damage by reducing carbon emissions. Geoengineering is too cheap to dismiss as a fringe strategy developed by sinister scientists looking for attention and grant money, as some pundits would have it. If anything, it’s the most experienced climate scientists who take the issue most seriously. And not because they want to. ...Pick your favorite analogy. It’s like chemotherapy or a tracheostomy for the planet: a last-ditch effort to do what prevention failed to accomplish. ... As always, it’s a matter of trade-offs. Climate change itself will have plenty of unsavory side effects. The question, then, is not whether geoengineering alone could wreak havoc. (It could.) The question is whether climate change plus geoengineering is better or worse than unmitigated climate change. putting sulfur particles in the atmosphere; ships that spray water vapor high into the sky to generate more cloud cover; painting all roofs a more reflective white; dumping plant nutrients (like iron) into the ocean so that the resulting plants will absorb more carbon; and others. For myself, I'm uncomfortably aware that I don't know much about the details of climate modelling. It does seems clear that a healthy majority of those who work in the area and are represented in the Intergovernmental Panel on Climate Change (IPCC) reports are concerned about the risks of climate change, so from an economic viewpoint, my usual attitude is to treat the risk as real and imporant--but focus on the economic problem of how to reduce those risks in cost-effective ways. For some earlier posts bearing on these issues, see "Climate Change Strategies (Including Mangroves)" (December 4, 2012), "Setting a Carbon Price: What's Known, What's Not" (June 25, 2013), "Short-Term Benefits of Climate Change Policy" (September 22, 2014), "Carbon Capture and Storage: An Update" (December 24, 2013), "Other Air Pollutants: Soot and Methane" (June 28, 2012), and "Should the U.S. Government Cost-Benefit Analysis Look Outside the U.S.?" (June 13, 2014). In my reading, even though the most recent IPCC report comes out with largely the same bottom line--that climate change is a serious problem needing a substantial policy response in both the near-term and the long-term--the most recent report makes the arguments in a tone of less certainty than earlier reports. As one example, the most recent IPCC report has a highlighted discussion in a box in the first chapter acknowledging that temperature trends rise 1998 to 2012 was much less steep than the earlier trend, and less than predicted (see Box 1.1 on p. 43 of the report). The report discusses various reasons why this might have occurred, with an emphasis that additional research is needed here: for example, one possibility is that volcanoes put more sulfur into the air than expected, a form of natural geoengineering that had a cooling effect; that El Nino warmed up the globe above trend in late 1990s, making the temperature rise in the 1990s look unexpectedly rapid, and the rise since then correspondingly slower; or that oceans trapped more heat than the models had predicted. For me, the risks of any actual efforts at geoengineering seem too high at present. But of course, this is another way of saying that I think the risks of climate change are not immediate or severe enough to be worth the risks of geoengineering. But as I noted at the start, if you believe that the risks of climate change are large and near-term--and moreover, if you have observed how difficult it seems to be for the world to take action to reduce carbon emissions substantially--then you should be looking at geoengineering very closely, even you hate the idea of needing to do so.